I’m currently rocking an orange pair of regular swedish goggles, but usually I wear blue/purple-ish. I also really like my pink pair of socket rockets. Yes, the reason one edge of my nosepiece is jagged and one isn’t is that one was cut with scissors and the other end was bitten off for a quick repair at practice. Swedish goggles are easy to fit to your face. If you use the goggle strap instead of the nosepiece, you can adjust them so they fit the width of your eyes perfectly! Swedish goggles can be repaired quickly. If the nosepiece breaks during practice, you can easily bite off a piece of the strap and string it through the nosepiece without wasting practice time. In my experience, swedish goggles don’t fall off during a start as often as other goggles. Note that I’m talking about a dive start from a block here, not a mass swim start! Swedish goggles are really inexpensive, probably the cheapest goggles out there, at less than $4/pair. Swedish goggles have lenses that come with a lot of options – they are available in regular and metallic colors for indoor and outdoor use. Swedish goggles don’t take up much space and they handle abuse well. Since they don’t have anything to protect the sockets, you can’t loose pieces of foam/plastic. Swedish goggles last forever, literally. All you need to do is replace the straps when they wear through. If that is too much of an inconvenience, you can buy bungee cord straps and use those instead, just be aware you’ll still have to replace the nosepiece from time to time. Swedish goggles are easy to find. They are so popular, that Speedo, Keifer & TYR all have their own versions available and some, like the TYR socket rocket, even have softer edges built in! When I’m wearing swedish goggles, I feel like I can see everything. Some goggles hinder my vision and even seem to mess with my depth perception, but not swedes! Swedish goggles can be adjusted as needed. You can tighten them before a race and loosen them afterward. If you use a strap for the nose piece, make sure you always have two pairs on race day in case the nosepiece breaks and you don’t have anytime to fix them! Swedish goggles take awhile to get used to. The first time I wore swedish goggles, they hurt my eyes so bad that I wasn’t sure if I could make it through practice with them on. However, I stuck with them and within a week (or two) my eyes toughened up and they’re all I train in. Nowadays, there are some more “friendly” versions of swedes available, with softer edges, that still fit directly in your eye socket. I prefer the original swedes, but I wear and enjoy both. I have learned that if I file the edges of original swedes just a bit, they don’t hurt at all. Swedish goggles don’t float for long. They may not be the best choice for a mass swim start because you’ll probably lose them if they fall off for some reason or other. I would still wear mine though because what they lack in flotation is more than made up with my range of vision. You have to assemble each pair of swedish goggles yourself, but it doesn’t take very long to do that, and you can get a great fit if you do it correctly. Great! Thanks so much for the tips! I will try them out with my next goggle purchase. 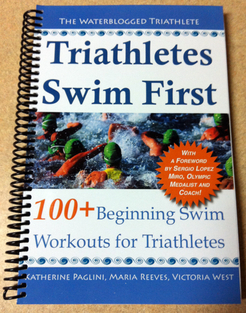 I encourage every swimmer to take the time to make the switch. They’re more secure, easier to de-fog mid swim while treading water in the ocean/lake, and you just LOOK so much cooler. Alexis, that is a fantastic point! I didn’t even think about de-fogging them when I wrote the article. Here’s a question – do you think your club swimmers adjust to them better than masters swimmers you’ve worked with? They do look the coolest, that’s for sure. Pros are winning hands down! I did have problems with mine leaking during starts for awhile, but that was usually fixed by pulling a cap over the top edge. However, as a distance swimmer, I practiced in swedes but raced in vanquishers for years because I was just a little too nervous (due to past experiences) about my swedes falling off on the start of a mile! There’s really nothing more annoying in a mile than a slow goggle leak or one lens off/one on. Oh, except having them end up in your mouth off the start! I remember you doing the cap trick – I also liked that added security even though my race was only two laps 😉 I’m so glad I was a sprinter! You milers are all crazy. Would you wear the swedes or the vanquishers in a triathlon that didn’t have a dive start? I think I would wear my vanquishers, actually! I still do the cap trick, now it’s a habit and allows me to focus on my race, not my goggles. But wearing vanquishers has now become part of my racing preparation, just the same as you have a racing/team suit, I had my racing goggles. So I think for me, it becomes part of the mentality more than the comfort of the goggles. I own a pair long time ago and I loved them, use it everyday and IMHO i think they are better than the regular goggles, I use to call em speed goggles and they are hard to come by in regular retail store, I didn’t know they were called Swedish goggles and retailers don’t understand me when I explain this to them back in 2000. I just read your review and will have to give those goggles a try. It will be tough to switch from my swedes though! I’m glad I could help you remember the type of goggles they are. We always had a surplus of them on all of the competitive teams I was on, but I don’t think I ever would have tried them if I wasn’t a competitive swimmer. If you decide to go back, try the socket rockets as they are very comfortable too. I like that you called them speed goggles – I totally get how you came to that name! Thanks for sharing your review! Enjoyed reading it.